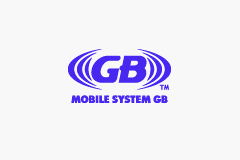 The first thing you see when you boot up the Japanese version is the Mobile System GB logo. Using an adapter cable, players could hook up a Game Boy Advance to their cell phone and challenge other players all across Japan. The service ended on December 14, 2002. 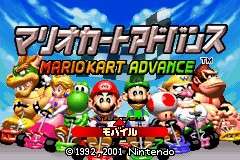 Mario Kart: Super Circuit is known as Mario Kart Advance in Japan. 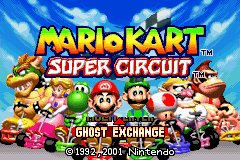 The third option on the title screen was changed from "Mobile" to "Ghost Exchange." In the Japanese game, Mobile takes you to the Mobile System GB setup screens. Once connected to the service, we assume Japanese players were able to exchange ghosts. Limited to local multiplayer, the U.S. version has a Ghost Exchange mode instead. 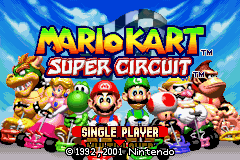 Super Circuit is the first Mario Kart game where the Time Trials courses come preloaded with times to beat to earn a place on the records list. Both the Japanese and U.S. versions have the same 1st place times, but places 2 through 5 are different in each. The times for Best Lap stayed the same. At first glance, the Japanese version's times look random, but 2nd, 3rd, and 4th place are each based on the place before them, and 5th place is always set at three minutes even (3'00"00). The U.S. version's times are all 30 seconds apart, which usually pushes 5th place over three minutes, making it easier to crack the list. Super Circuit's "Extra" cups contain remakes of all 20 courses from Super Mario Kart. 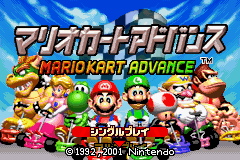 In the Japanese version of Super Circuit, all instances of the word "Course" were removed from the original SMK Japanese course names, most likely due to a shorter name length limit. The following names are from the game manuals. Boo: "Teresa" comes from the Japanese verb tereru (to be shy). Spiny Shell: "Togezō" is the Japanese name for Spinies.